Phuket, a rainforested, mountainous island in the Andaman Sea. It has some of Thailand's most popular beaches, mostly situated along the clear waters of the western shore. The island is home to many high-end seaside resorts, spas and restaurants. Phuket City, the capital, has old shophouses and busy markets. The island of Phuket has long been misunderstood. Firstly, the 'h' is silent. And secondly, Phuket doesn't feel like an island at all. It's so huge, 49km long, the biggest in Thailand, that you rarely feel surrounded by water. Branded the pearl of the Andaman, this is Thailand's original flavor of tailor-made fun in the sun. Ultimately, the island's affinity for luxury far outshines its other stereotypes. Jet-setters swing through in droves, getting pummeled during swanky spa sessions and sipping sundowners at fashion-forward nightspots or on rented yachts. And you don't have to be an heiress to tap into Phuket's style-packed to-do list. With deep-sea diving, high-end dining, luxury shopping, fabulous white beaches and some of Thailand's swankiest hotels at your fingertips, you might forget to leave. With so much to see and do, Phuket is a great place to experience, and there are several options for exciting activities and tours in or near the city. After hotel pickup from Phuket, board a boat and cruise onto Phang Nga Bay, inside Thailand's Ao Phang Nga National Park. Set between Phuket and the Malay Peninsula, this spectacular bay is characterized by lushly wooded islands and limestone karsts jutting from the sea. See rubber plantations and locals going about their daily life, and visit a Buddhist cave temple known for its colonies of monkeys. Then, enjoy a scenic cruise through mangrove swamps, watching for monkeys and other wildlife on route. Next, make your way to Khao Ping Kan, the ruggedly beautiful island nicknamed James Bond Island, for featuring in the 1974 movie The Man with The Golden Gun. Admire the limestone walls and caves, relax on the sands, and take photos of the 66-foot (20-meter) islet of Ko Tapu that served as the villain's hideout in the movie. Continue to Koh Panyee, a floating, stilted Muslim village set above the waters. After a delicious seafood lunch here, board a canoe with a guide to do the paddling, and drift around the caves of Talu Island. Soak in the scenery as you glide through rock tunnels, lagoons, and limestone caves. 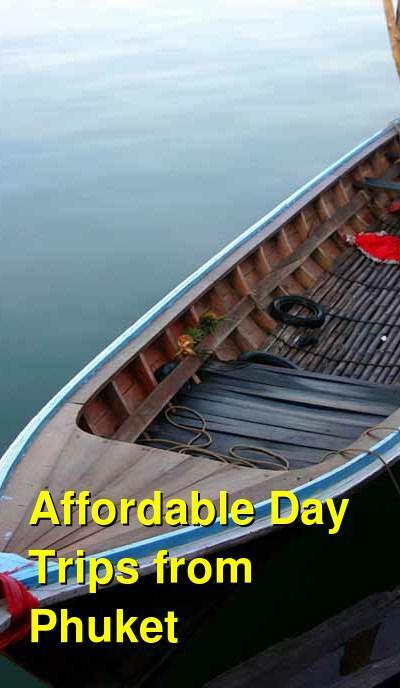 Your tour then ends with a hotel drop-off in Phuket. Your island-hopping tour of the Similan Islands begins with early morning pickup from your Phuket hotel and transfer to the waterfront to board your speedboat, which covers the 44-mile (70-km) distance across the Andaman Sea to the islands in less than two hours. 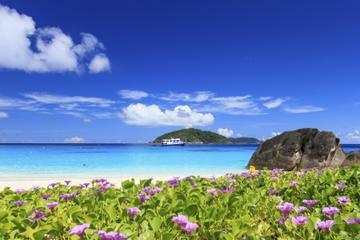 The Similans' nine islands are home to lush rainforest, granite boulders and white-sand beaches above the water, while coral reefs create a colorful underwater world. Your first stop takes you to the white-sand beach of island eight. 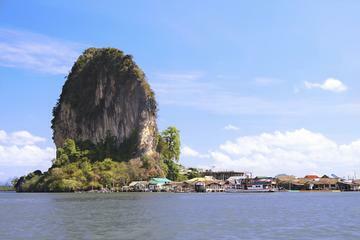 Go hiking to the top of the Sailing Rock a huge Granit rock formation and go snorkeling among an array of fish in clear, warm water, or sunbathe on a pristine beach and revel in the tranquility of this virtually deserted tropical paradise. At midday, head to the west coast of island eight, to enjoy a homemade buffet Thai lunch on a deserted dream beach under palm and banyan trees. After lunch take a short hop to Island Nine for more snorkeling and beach time. Your guide can help you to identify fish and other creatures that you see. 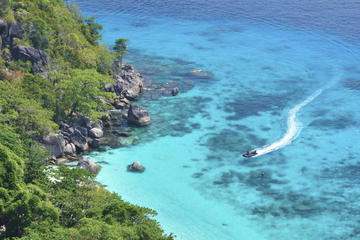 Then take a short hop to one of the best snorkeling site of the Similans for more snorkeling with sea turtles. In the mid-afternoon, return to your speedboat to return to Phuket, keeping an eye out for dolphins and other marine life along the way. When you arrive at the dock in the late afternoon, your air-conditioned minivan awaits to return you to your hotel. Meet your friendly local driver at your Phuket hotel and head out on a memorable all-day adventure. Travel in air-conditioned comfort to the Dolphin Seaway Pier, where you'll enjoy some live music before making your way to Phang Nga Bay by speedboat. This epic waterway is famous for its limestone karsts and incredible scenery. More than 100 islands dot the turquoise waters here. Check out James Bond Island in Ao Phang Nga National Park, which was made famous in the 1974 movie The Man with the Golden Gun. You'll speed towards your next destination, Talu Island, on your Phuket speedboat. Head out on a tiny canoe with your guide, who will paddle through sea caves and quiet lagoons while you relax and soak up the sun. You can explore the caves on foot using provided helmets and flashlights and check out secret caverns with names like Ice Cream Cave. Once you've stretched your legs paddle back through mangroves and swamps of this untouched nature preserve. Take a swim break if you're interested, or continue on to your traditional Thai lunch. You'll savor local cuisine at Koh Panyee, a stilted village with amazing bay and mountain views. Check out daily life and learn more about this unique community from your friendly guide. Finally, head to Naka Island, where you'll have some time to relax on the secret shores of this out-of-the-way destination. Once you've worked on your tan and taken a dip in the waters you'll head back to Phang Nga Bay and eventually Phuket, where your friendly guide and driver will deliver you to your hotel. After hotel pickup by minivan, travel about one hour north of Phuket to Suwan Kuha Temple, located in the province of Phang Nga. Along the way, your guide shares informative commentary about the region. When you arrive, walk into the lofty cave that shelters Suwan Kuha Temple to admire an elegant reclining Buddha statue that measures 45 feet (15 meters) in length, as well as a chedi (Buddhist stupa) and other statues that decorate the cave temple. Snap photos of wild monkeys that hang around outside. After 30 minutes at the temple, continue your day trip to the nearby pier, where you'll step into a longtail boat for about four hours of touring Ao Phang-Nga National Marine Park (aka Phang Nga Bay) by water. First up, cruise over to the island of Koh Panyi, where a fishing village sits at the base of towering limestone cliffs. Founded more than 200 years ago by Malay fishermen, the Muslim village consists primarily of buildings that sit on stilts over the water. You have about one hour here to enjoy a Thai lunch at a rustic restaurant with your guide and spend free time checking out the village. Don't miss the floating soccer field, the ingenious invention of local soccer-loving kids. 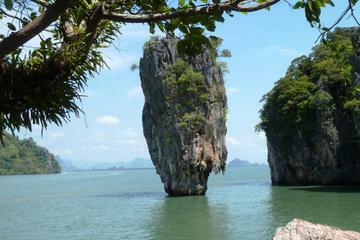 Next, continue by longtail boat to Koh Khao Phing Kan, aka James Bond Island. Famous for its role as a filming location in the 1974 James Bond movie The Man with the Golden Gun, the island features sculptural rock formations and a sandy beach. From James Bond Island, hop over to Talu Island for a guided 30-minute tour in sturdy rubber canoes. 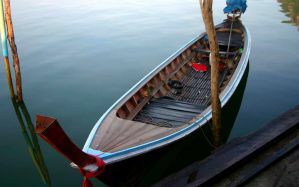 Then switch back to the longtail boat to return to shore, where you'll board your minivan for the ride back to Phuket for hotel drop-off.